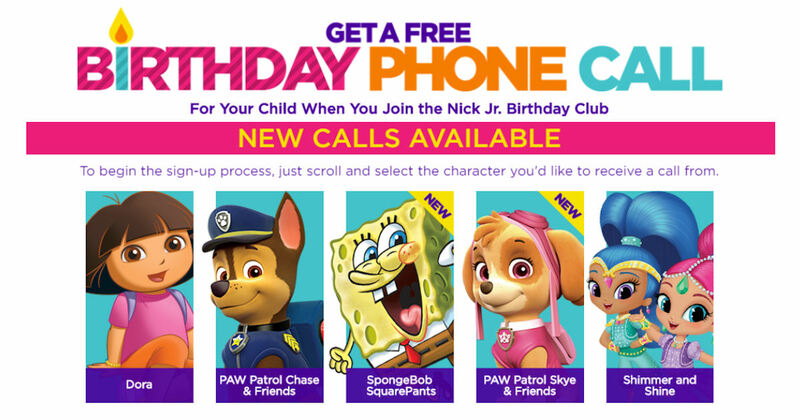 Make your child's birthday a little more special with a free birthday phone call from their favorite Nick Jr. character! Scroll through and select the character you'd to call. Then fill in the short form with a few details about you and your child. You'll be able to preview the call and hear exactly what your child will hear before finishing the scheduled date and time. Characters available now include: Dora, PAW Patrol Chase & Friends, Spongebob SquarePants, Wally, Peter Rabbit, Dora and Friends, PAW Patrol Skye and Friends, Shimmer and Shine, Blaze, and Bubble Guppies.